It was a wonderful day for everyone who congratulated Courtney & Shaun’s wedding at the famous Loeb Central Park Boathouse. While the bride got ready at the Lotte New York Palace Hotel, the groom got dressed at the New York Marriott East Side, both surrounded by their family and friends. After prepping, they saw each other for the first time in the hotel lobby as it was romantically raining outside. Shaun was blown away by seeing his gorgeous bride in her one of a kind Vera Wang gown. After, the couple loved having their wedding photos taken at iconic New York City spots. Courtney & Shaun enjoyed themselves with umbrellas hand in hand and the rain made the night even more special and romantic. 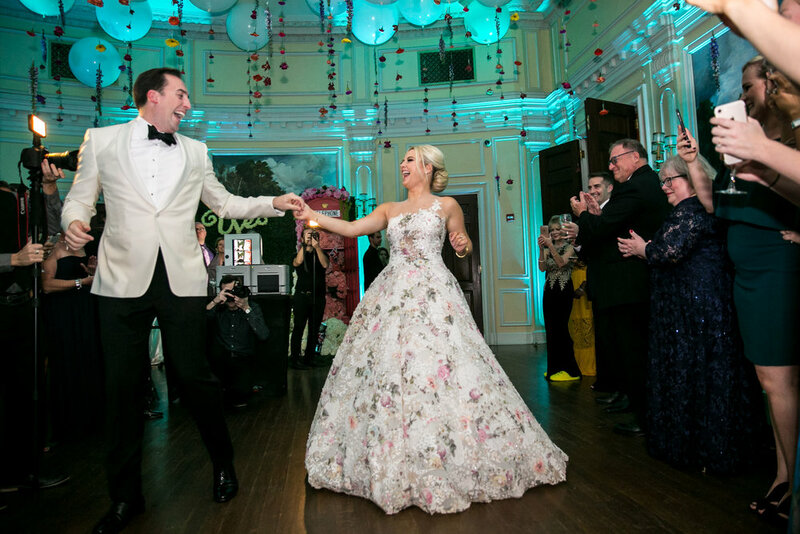 With lots of beautiful flower decor provided by Lenox Hill Florist, tons of dancing, toasts and delicious food, it was a memorable day for the couple and everyone invited. It was a pleasure capturing this special day together with Keith Brady Media and Laura with Laura Remmert Events, who made this day even more perfect. Let's count the things we love about this Indian - Jewish wedding. The brides absolutely exquisite outfits, the fact that Marin & Jeev celebrated both an Indian and Jewish ceremony at one day, and of course the backdrop of stunning New York City. But even beyond all that, we loved the play of colors in this wedding- from the red and gold with a splash of rose and ivory. Not to mention the many traditions especially the colorful mehndi and the fun Baraat Celebration. Check out the details below! Marin & Jeev started off their wedding celebration with the Sangeet & Mehndi at Studio 450 with the perfect view overlooking the city. With the amazing talent and hard work of planner & florist, Marie Danielle Vil-Young with A Votre Service Events, the weekend celebration could not begin any better. The ladies enjoyed Henna provided by Brooklyn Henna Company while Benares Caterers passed their delicious hors d`oeuvre. DJ Suhel and the Dhol Players made sure the Sangeet was a one of a kind evening. Our team could not wait to capture the next day! Ready and excited for the big day, the bride got ready with Hair Stylist Cassie Harwood-Jacquet at the Kimpton Eventi Hotel while the groom got his turban tied at the Conrad. After some finishing touches and final accessories, Marin got escorted by a very elegant Rolls Royce to the days location, the Lighthouse at Chelsea Piers. In the meanwhile, Jeev got celebrated during the Baraat at Pier Sixty sitting on top of a stunning white horse provided by Equishare Baraat horses. Abigail Kirsch Caterers set up breakfast and the Langar while Dj Suhel and the Dhol player got ready for the day. After the Baraat and breakfast, the guests removed their shoes and covered their heads to enter the "temple", beautifully decorated by Jeannie Forunato with Atlas Florists. After a quick portrait session, the newlyweds headed to the Kimpton Eventi Hotel so Marin could change into her second, stunning gown of the day. This truly special dress took Jeev`s breath at their "first look". It was a pleasure taking the bride & groom for a quick tour through the city, making stops at Tribeca, the Flatiron district and the magical Grand Central Terminal before heading to Pier Sixty for their Jewish Ceremony. After saying their "I Do`s" the couple was welcomed as the new Mr. & Mrs. and danced through the night together with the team of Starlight Orchestras. We had such a great time shooting this very elegant, New York wedding held at the famous Oheka Castle. Not only planner Tamara with TSP Events did a flawless job, but also florist Bride & Blossom and the amazing team of Cafe Wha made this day unforgettable. It was a pleasure capturing all those beautiful moments and details together with videographer Craig William Films. It was a perfect day full of energy, laughter, and love. This was definitely one of the more romantic weddings we’ve had the pleasure of shooting this Winter. New York City set again the stage for an intimate gathering amongst family and friends. Laura of LIG Events definitely created a day & night to remember. The ladies of Facetime Beauty let our beautiful bride glow. Caroline`s smile said it all and we could not wait for her to see her groom Matt for the first time! After a magical first look, the couple and their bridal party headed to iconic Central Park. Our team and Craig William Films captured a beautiful, chilly but sunny afternoon before the couple said their "I Do`s" at one of the most beautiful churches in the city, St. Paul the Apostle. 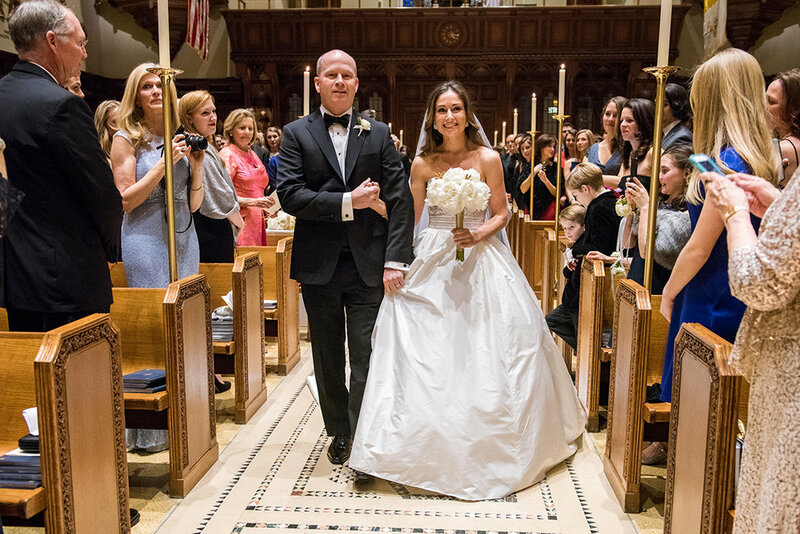 The newlyweds then continued their celebration at the New York Athletic Club full of stunning flower arrangements with the help of Frank Alexander NYC. Not only the team of Oh Snap Smile did an amazing job, but also Soulsystem made sure of an amazing atmosphere all night long.The bride & groom`s cake, provided by Sweet Lisa`s bakery, was simply the cherry on top of this perfect winter wedding day. We loved every part of this classy, vintage inspired New York City wedding! Thank you to all the amazing vendors and our beautiful couple, Caroline & Matt! A beautiful day with your loved one, lots of laughter, love and golden hour in the heart of NYC; the perfect ingredients for an unforgettable and successful engagement session. We are thrilled to share some of our favorite engagement moments of 2017 for a good idea on how we capture the two of you being, well, you! Engagements are a GREAT way to practice with your photographer ahead of the big day! We love to take you on a whirlwind tour of our favorite spots all around the city starting in Central Park, going through Grand Central and finishing on the High Line for golden hour. We also love it if you have a place in mind that's something more personal and special to the two of you, for example your favorite restaurant or the place your loved one popped the question! What you get is a set of candid and natural photos of the two of you in your favorite outfits, being you in the city (or destination!) that you love. Not to mention, you really get to know your photographer. This makes the wedding day that much more enjoyable! We love a classic NYC wedding, especially a NYC Winter wedding. Mimi & Matt`s magical wedding is just about as timeless and "New York City" as it gets! The couple got ready for their big day at the classic New York Athletic Club. Mimi`s dress was a breathtaking and stunning gown by the one and only Reem Acra paired with gorgeous Christian Louboutins. Dyana Nematallah and the lovely ladies from Facetime made sure the brides hair & make-up was flawless! Before our team and the videographers from Craig William Films knew it - Mimi was off to the Church of Our Saviour to walk down the aisle and meet her future husband, Matt! After the couple was married at one of the most beautiful churches in the city - Mimi & Matt then surprised their guests with a hot dog cart giving away pretzels - "we just tied the knot". Right after, the two of them walked the streets of NYC and took some classic shots at Central Park. Just in line with the Holidays, the newlyweds bumped into various Santa Clauses as it was also the day of the famous SantaCon! Later on, the celebration kicked off with the talent of Element Music. Not to forget the beautiful creations by florist Frank Alexander. The couple was also lucky to have planner Laura Irizarry with LIG Events on their side. It was a pleasure being a part of their big day and thank you to the dream team of vendors that made their wedding so perfect! This past August, it was our pleasure to watch Jennifer & Pri come together and become husband and wife. The lovely bride dolled up for her big day at the Glen Island Harbor Club, excited as ever together with her gorgeous group of bridesmaids. The handsome Sri Lankan groom got ready to meet his beautiful bride for their first look at the castle. After some precious moments, the couple met up with their bridal party to have some photo fun. Afterwards, they finally said their "I do's." at the club full of beautiful ceremony traditions. The newlyweds enjoyed the time to take wonderful photos throughout the area and celebrated their love all night long. We were honored to capture the heartfelt moments on this special day, along with Craig Williams Films.